Although there is no denying that online shopping has brought much convenience to people’s lives, the issue poses a great challenge for retailers as there is a number of points to consider. What kind of devices do Nigerians use to shop online? How much money do they spend? How does the shopping activity change across the year? Is online shopping more popular among men or women? To look for answers, Picodi.com analysed last year’s data and presented the results in this report. Mobile commerce is booming globally and it looks like Nigerians joined the trend. According to our internal data, 2 out of 3 transactions were made with the use of a mobile device last year. However, Nigerians tend to spend less when using smartphones. When they did shopping with the use of a phone, the average order value was only ₦14,100. It’s about ₦3,500 less than when using desktops (₦17,600) and ₦5,000 less than when using tablets (₦19,100). iOS users spend more than Android users — ₦16,600 vs ₦13,400 on average. The important question is who shops online more — men or women? Our data shows that there were more purchases made by Nigerian men than those made by women, 63% and 37% respectively. Unsurprisingly, it’s the young generation that prefers online shopping. More than half of all online shoppers (56%) are people between the ages of 25 and 34. They’re followed by people aged 18-24 (17%) and 35-44% (17%). The remaining 10% are consumers who are over 45 years old. According to our research, the average order value of a Nigerian shopper is the highest in January (₦25,808), followed by April and November (₦22,936 and ₦18,657 accordingly). If you look at the shopping activity, it turns out November has the highest number of transactions — 17.3% of all the transactions made during the year. The second busiest month when it comes to the number of transactions was December (12.3%), followed by October (17%). Last-minute Christmas shoppers might have greatly contributed to such a high number. The lowest number of transactions was noted in January (3.1%). If we look at the activity of Nigerian consumers across the week, it turns out that mobile users are the most active on Sunday (21% of all weekly transactions). On the other hand, shopping on computers is preferred during the whole weekend. Nigerians definitely prefer to shop in the afternoon: the peak of sales occurs between 12 and 6 PM. The most popular categories for online shopping among Nigerians were: food on delivery, electronics, clothing, goods from China and home appliances. 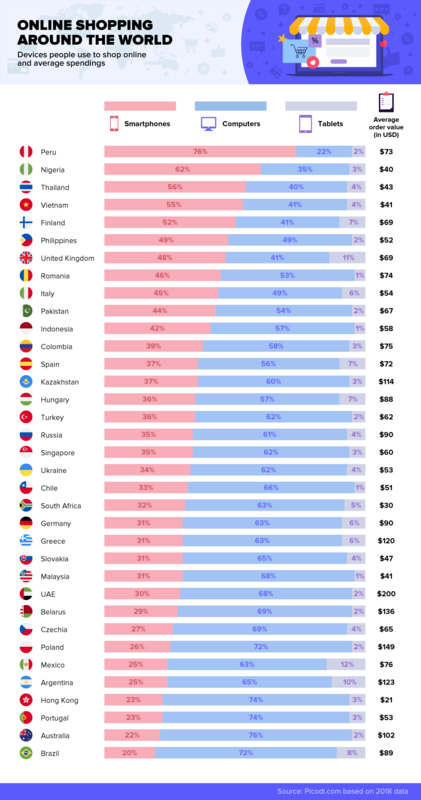 We analysed data from 35 countries and compared the devices people use to shop online and the average order value. Nigeria, with 62% of orders made on mobile devices, is among the countries where mobile shopping takes the lead. Peru tops the ranking with 76% of online purchases made with the use of smartphones. Close behind is Thailand (56%). However, when it comes to the average order value, Nigerians with their US$43 (₦15,486) rank lower than the world’s average, which is US$79. Emiratis spent the most money per order — astonishing US$218. And it looks like Hungarians and Turks don’t like to spend a lot in one go. They are at the bottom of the ranking with US$32 and US$38 respectively. This report uses the internal data of a global e-commerce platform Picodi.com for 2018. For currency conversion, we used the average exchange rate for March 2019. Do We Really Want the Subsidy Regime Back?